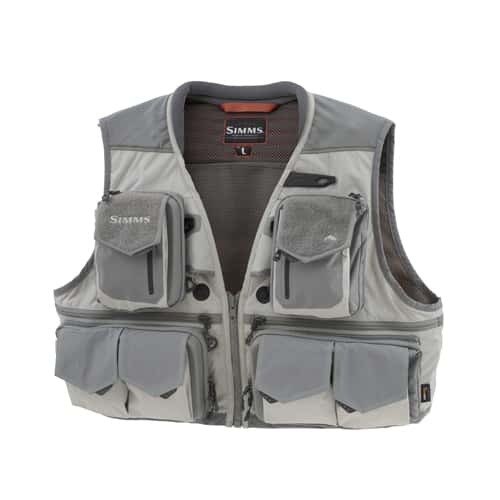 The Simms G3 Guide Fly-Fishing Vest is a fly-fishing vest that is one of the most popular fly-fishing vests on the market today as well as one of the most top selling fly-fishing vests of all time. The G3 Guide Vest has 24 functionally placed pockets that maintain everything from flies and fly boxes to split-shot, licenses, cell phones, spools, leaders, and more for extra easy access while you’re fly-fishing at your favorite fly-fishing destinations. This Simms G3 Guide Fly-Fishing Vest has a total of 24 pockets that include 2 large zippered pockets on the fly-fishing vest front chest, 2 vertical weather-tight chest pockets, 2 cargo chest pockets, 4 waist pockets, 4 large horizontal zippered waist pockets, 4 interior pockets, 2 large interior horizontal zippered pockets, 2 large interior vertical zippered pockets, 1 weather-tight split back pocket and 1 bellowed back cargo pocket, making this fly-fishing vest contain more than enough room to store all of your fly-fishing gear for a great day out on the river. This fly-fishing vest has a center front YKK zipper and buckle closure and 2 patented built-in retractor clips, 1 net-carry and 2 tool attachment D-rings. This fly-fishing also is designed with cushioned, stretch mesh shoulders and padded rib knit collar. The Simms G3 Guide Fly-Fishing Vest is constructed with 100 percent Cordura nylon ripstop fabric with Teflon water resistant finish and a 100 percent polyester lining, all of which are specifically designed to minimize corrosion and have abrasion resistance. This fly-fishing vest is also extremely durable and well respected with fly-fisherman for its great functionality and because of the amount of storage capacity and technological brilliance. We believe the Simms G3 Guide Vest has more pockets than you could ever use! on 6/8/2018 I Expected Quality, Got Excellence! I thought this would be a quality product and I was right! All of the pockets are easy to access and the vest is durable and light weight. Very comfortable to wear loaded up, and I love the thermolaminated pockets for storing fly boxes! Great rod holder with strong Velcro to hold rod while your tying a fly on. Also there are 2 options to keep the vest closed- 1) There is a zipper in the front to keep you locked in when fully loaded. 2) There’s a small magnetic closure in the front which keeps the front of the vest open, yet secure, for those warmer days! Not much to complain about. The only small thing I wish was improved are the zingers. They seem a little stiff and I wish they could stretch a little longer. Maybe with time and more use it will stretch easier. That is a very minor complaint on my part and should not affect your decision to buy this awesome vest! One plus with the zingers though, is the magnetic docking stations that keep your nippers/hemostats stationary. Top notch! Preparing for the season, I bought simms g3 guide vest. When I heard that simms g3 guide vest is the best, I just bought it without any problem. It was a product that showed signs of care in more detail than I expected. It is of a higher quality than expected, and quite satisfied. The most amazing built-in retractor. I never thought there would be two retractors inside the vest. Very satisfied. All but the outside is made of mesh. I think I can use it in summer. According to the product description, it has as many as 22 pockets. Now it will come in handy when the real season begins. I recommend this product. Simms definitely covered everything when it comes to this vest. Plenty of pockets for all your goods and sewing/ zippers are made to last. Although it's a little pricey this vest is worth every penny. I've taken it out a few times and it's a significant upgrade from my old Columbia vest. More pockets than anyone could need but it's still really slim and more comfortable than any other vest I've tried on. My one concern is that the built in retractors are a little shorter and stiffer than your typical pin on zip retractors, and the end attachment might snap eventually, but they're worked great so far. Wyoming Fly Fishing was great as well, product was packaged perfectly and shipping was super fast with email tracking notifications. Would definitely buy from them again. on 11/24/2016 good ! good ! I just love it. Thank you. Been kind. I'll use often Give me a coupon ^^ Satisfied.